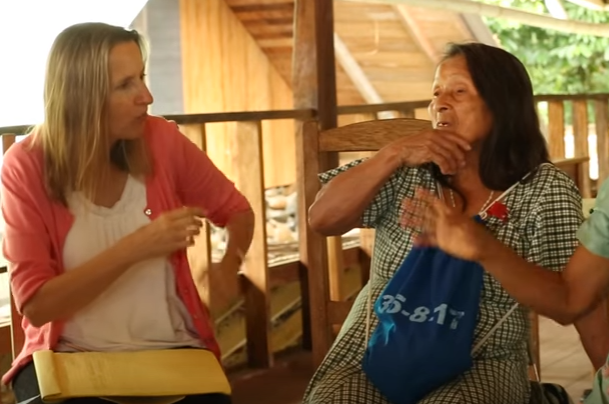 Janis Nuckolls shares her love for the Quechua people and the research she has done on their language and ideophones. Nuckolls, a professor of linguistics and English language at BYU, recently published Lecciones de una mujer fuerte Quechua: ideofonía, diálogo y perspectiva, the Spanish version of her book My Lessons from a Quechua Strongwoman, Ideophony, Dialogue and Perspective which was originally published by the University of Arizona Press. Her work features the stories of Luisa Cadena, a Quechua woman she met on one of her trips to Ecuador. From their first meeting, Cadena became extremely important in the research of Nuckolls. “She’s been my very important consultant ever since I was writing my dissertation. We became very good friends and I really started understanding the language because of her great ability to tell very engaging stories,” explained Nuckolls. Part of Nuckolls’ interest in Quechua is studying the functions of ideophones, which are words that offer a vivid sensory impression through sound, movement, shape or action. Nuckolls described it as painting a word picture–even though they are words, they function as images which communicate not only with sounds but with gestures as well. Quechua, in particular, is full of ideophones that may also function grammatically, to comment on the completeness or ongoingness of an action, giving the language a lively and expressive quality. Luisa Cadena uses many ideophones in her storytelling, which is part of what makes her stories so engaging. “I’m sure I don’t know all her stories, even though I have over 800 pages of transcriptions of her stories. She’s just the kind of person who experiences life with real enthusiasm; she just seems to have a talent for leading an interesting life,” said Nuckolls. Hannah covers events for the Linguistics Department for the College of Humanities. She is a senior pursuing a degree in art history with a minor in art.